How is a party designed? What do you need to get a party working? Actually there are a few tools, rules and structures that are important. In this chapter we are going to look at that. We will also look at the bits and pieces that the party is built of and how they should work together. Every party needs a Constitution. The party’s Constitution serves as the law of the party’s structures on all levels but it also covers the internal procedures. It thus contains the party’s ideological foundation, it’s values, principles and rules for decision-making and elections as well as for how members that disqualify themselves can be expelled. It could thus be called the Starting point of the party. Explore the image below to read more about the different structures. Each of these geographical levels has a somewhat similar order of authority. This manual and learning website is focused on the the Branch. It’s the party’s most important body. In any area a certain number of members can form a local party structure called a Branch. It usually consists of between 50 to 1000 members. A Branch with active members and many activities that reach out to society is a party’s best asset. The Branch members are the party’s ear to the ground and are also the best ambassadors for the party since they are able to talk directly to people in the communities. So what are the tasks for a Party’s Branch? The Branch formulates and proposes policies to higher levels. It holds higher structures in the party to account. But the key task for the Branch is to recruit members and to activate them. Similar to the constitutional structures covered above the local level or Branch has an Executive Committee. The members elect the BEC at the Annual General Meeting. Explore the image to see what kind of tasks that is the responsibility of the BEC. In order to truly represent democratic values in society it is imperative that the party itself must adhere to democratic principles. To be open to discussions, to encourage free debate and criticism. To make everyone feel that their opinion counts no matter position or gender. Here also lies the challenges. This is a big challenge, because at the same time the party has to maintain a good party discipline and all members must respect the party’s organizational code of conduct. A party decision on an issue should be preceded by information, debates and consultations so that members have a say. When a majority decision has been made by a party structure, at whichever level, then that is the party’s formal view. All members must abide by democratically taken decisions. Furthermore, decisions made by higher structures are binding on lower structures. A party must act coherently for many reasons. Every member must understand that this entails supporting and being part of a party where the majority sometimes makes decisions that individual members do not agree with. This section is a summary of the information found on pages 8 to 23 in the book. 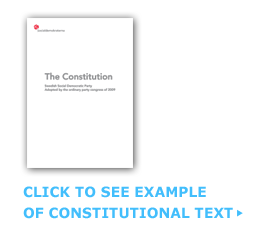 Why does a party need a constitution? There are several principles that guide the internal democracy in a party. Which of these alternatives is such a guiding principle? Discuss: What is party discipline? Which level constitutes the base structure of the party? What is the key task of the Branch? What is the role of the the BEC (Branch Executive Committee)? How do members elect leadership? Which of the alternatives below is an important standard of conduct for BEC members? Discuss: What is most important for members to trust their leaders?